Jumping rooftop to rooftop, the silent silhouette inspires curiosity. She is quick, light and agile. Illustrator Sho Murase found her, brought her to the deep catacombs of DC Collectibles and gave her a form, life, and at almost 7-inches in vinyl, a style unlike any you've ever seen. You're curious, he can tell…it's kind of her thing, she's Catwoman. 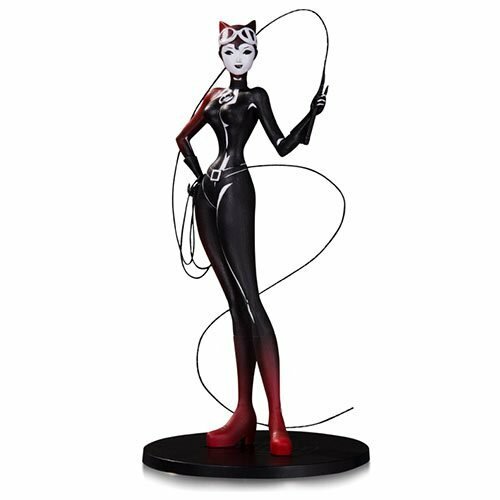 DC Artists' Alley is a graphic and stylized PVC collector statue line from DC Collectibles based on designs from today's cutting edge artists. Channeling the popular comic convention experience, DC Artists' Alley brings unique, artistic viewpoints to the DC Universe through highly-detailed, limited edition designer vinyl and includes a print featuring the original artwork the figure is based on.